Clearaudio Concept review | What Hi-Fi? Best turntable £800+, Awards 2015. A thoroughly sorted, easy-to-own package with tremendous sound. What more do you want, jam on it? So, if you’re not familiar with the Clearaudio Concept turntable by now, the concept is essentially getting the most exceptional sound you can from your records at this price. If that, combined with the five stars at the top of this review and this deck’s mantelpiece full of What Hi-Fi? Awards, doesn’t convince you to part with a grand, we suppose our work is cut out with the remaining stretch of this review. Simplicity is a big part of this package’s charm. Unlike some rival designs, which require patience, a steady hand and a passable grasp of mathematics to get working, the Concept is a 'plug and play' product straight from the box. The company’s own moving-magnet Concept cartridge is fitted to the Verify Direct Wire Plus tonearm (though there is also a moving-coil alternative available), and Clearaudio sets everything, including the cartridge weight and bias, before the turntable leaves the factory. As with all turntables, you’ll need a level, rigid and properly damped support for this deck to sit on if you’re serious about getting the best out of it (at £1000, you should be). You can fit a platter and a drive belt, can’t you? Of course you can – and then the Concept’s ready to play. Before dropping a record into place, though, it's worth taking a moment to admire the Concept's clean design and chunkily substantial finish. Speed (33.3, 45 and 78rpm) is controlled by a hefty rotary dial, and the whole thing operates with the sort of solidity more readily associated with outside water closets. Being so largely redundant during set up, all that’s left for us to do is dig The Pixies’ Doolittle from its sleeve, delight in drawing the Concept’s magnetically-poised tonearm – which has a magnetic bearing – over the edge of the record and let it drop gently into place. Kim Deal chugs those first four bass notes and guitars yell as we anticipate being hit by the opening track Debaser like a fist to the thorax. What’s immediately so impressive is that it’s so incredibly taut, matching its blistering pace with extraordinary poise and agility; something like the Rudolf Nureyev of £1000 turntables. It isn’t the weightiest of sounds in terms of low-end anchor, but the bass guitar feels anything but cumbersome, afforded the same light feet as its six-stringed cousins, and it’s certainly far away from substantially lacking in terms of depth. As we tear through the opening tracks without pause for breath, we also find it difficult not to be enamoured by the precision of the Concept’s timing. It’s incredibly fast, yet consistently in control, never stumbling or tripping over its laces. Pixies’ frontman Black Francis’s rhythmic gasping in Tame, for example, has that combination of pace and restraint that builds anticipation to fever pitch ahead of the final capricious chorus. Afforded a slight reprieve as the intensity is relaxed a touch for tracks such as Wave Of Mutilation and Here Comes Your Man, we now also have time to explore the ample space within the mix. There is air around the instruments; they have room enough to interact without ever colliding with one another, allowing us either to focus on a singular part or let ourselves be immersed in the whole. If analysis is a chief concern, it is further aided by the Concept’s transparency and level of detail of which JRR Tolkein would be proud. Having expended both sides of Doolittle, we dig out some Django Reinhardt. Short of seeing the room and smelling the air for ourselves, Clearaudio comes close to transporting us all the way to 1930s France. It’s like the company’s proof of honesty being the best policy, refusing to sand off any edges that would alter or dilute the character of the music, instead digging into the timbre of the instruments to let them tell whatever is their own story. And what story do they tell here? Reinhardt’s tale is often one of complex dark and shade, rife with slides and trills – a spritely dance with delicate dynamics. By now you’ll be unsurprised to read that the Concept tracks this dynamic journey step for step. It is this delicate sense of alternating intensity that sets the very best hi-fi apart, and a significant factor in giving Clearaudio such a stranglehold on this portion of the market. Indeed, the company’s glut of What Hi-Fi? Awards should indicate we find no discernable shortcomings at this price, though that isn’t to say this Clearaudio is the perfect option for everyone. 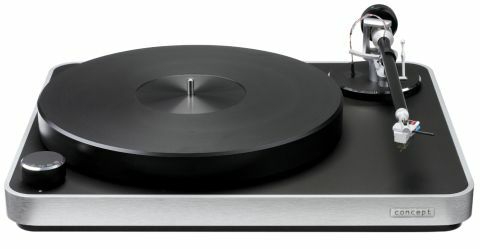 Many might, for example, prefer the more vigorous performance offered by the Rega RP6/Exact. Knocking at the Concept’s door with more urgency though, is the updated (SB) version of Pro-Ject’s 2Xperience, which perhaps isn’t so widely talented but has a satisfying warmth that also makes listening to it a joy. But, no, we can’t see anyone turning down the Clearaudio Concept for a lack of talent. It is as clean, rhythmic, detailed and spacious as you’ll find for the money, not to mention engaging and entertaining. A Conceptual masterpiece, you could say.